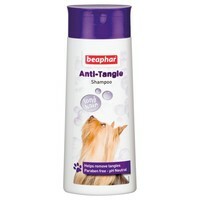 Beaphar Anti-Tangle Shampoo for dogs is a mild shampoo, specially formulated to help prevent knots and tangles, most suitable for long haired dogs. It strengthens the hair from root to tip, leaving the coat shiny and healthy, making it difficult for knots to form and easier to comb. This PH-neutral based shampoo is suitable for even the most sensitive of skins and will leave your dog smelling fresh and clean.